Welcome to the town page for Chatham. Explore your town map to discover people who lived in your town during the First World War. Chatham has a distinguished history as a military town that began long before the Great War. 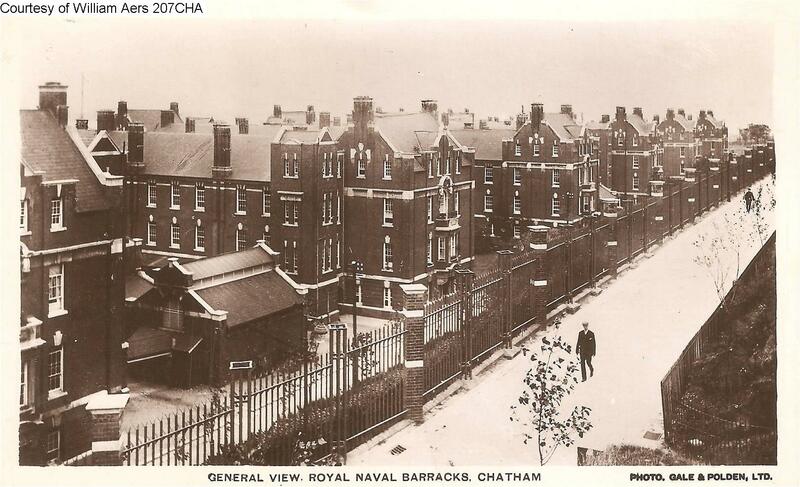 Chatham was one of The Royal Navy’s three manning ports, and a key function of the Naval Dockyards was to build and repair ships, meaning that apart from the military there was a strong civilian workforce that included women. The impact WW1 would bring to the town was felt from a very early stage, when on 22nd September 1914 three Chatham ships on patrol in the North Sea were sunk by one U-boat. In less than an hour, around 1,500 sailors had lost their lives. Following this, on 26th November 1914, HMS Bulwark exploded without warning whilst moored in the River Medway, causing much concern about the reason for the explosion. The explosion left only 12 survivors, and brought the War even closer to home. Back on land, Chatham was also home to various army regiments including the Chatham Division. The RE Reserve Battalion and Depot Companies based in Chatham were part of the mobilisation of the British Expeditionary Force at the outbreak of War. The town was busy with extra military personnel and local buildings were commandeered for military purposes. Fort Amherst was utilised to house troops and supplies en-route for France, and Fort Pitt Hospital continued as a Military Hospital as well as being used as a prison for captured German soldiers. Extra defences were developed to defend the town from landward attacks. Known as the Chatham Lines, they included a number of two person concrete pillboxes designed to contain Vickers machine guns. As a prime military target, Chatham was also bombed from the air by both Zeppelins and aeroplanes, and there was a considerable loss of life on 3rd September 1917 when the Barracks at HMS Pembroke were hit. 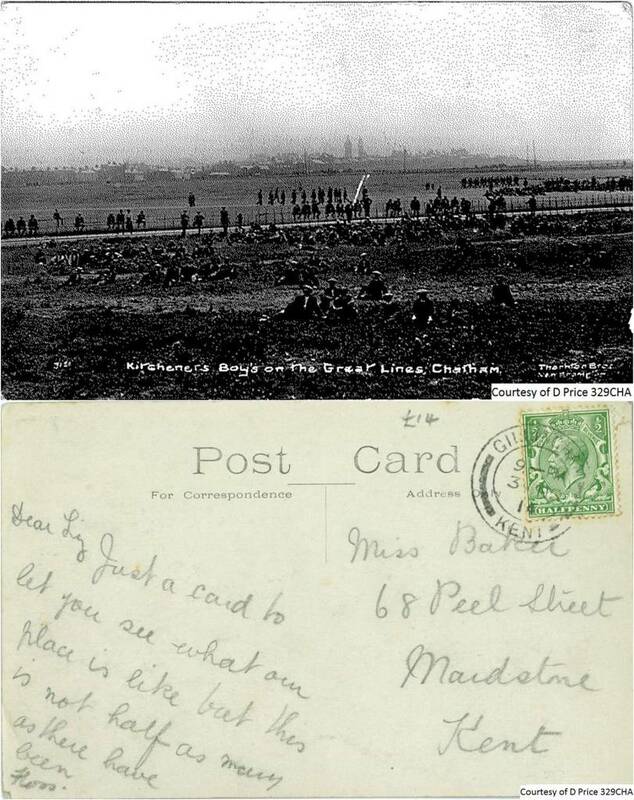 This postcard is entitled Kitchener’s Boys on the Great Lines, Chatham. The Great Line is situated between Gillingham and Chatham and is owned by the MOD. It was used as a training ground during the First World War. 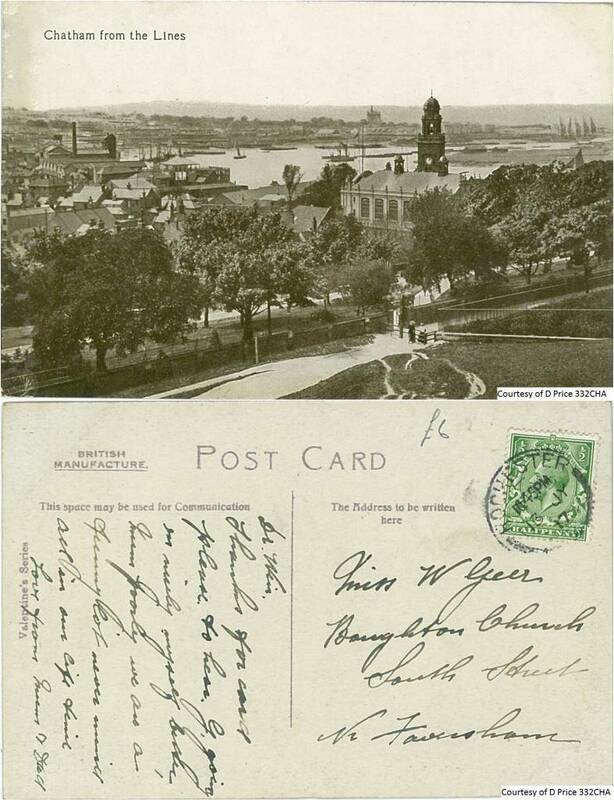 This card was sent 3rd November 1914. Shown in these pictures is The Royal Naval Barracks from a general view and The Barracks from The Terrace and Men's Quarters view. These pictures were taken in 1920 but would have been what the Barracks looked like during the war. 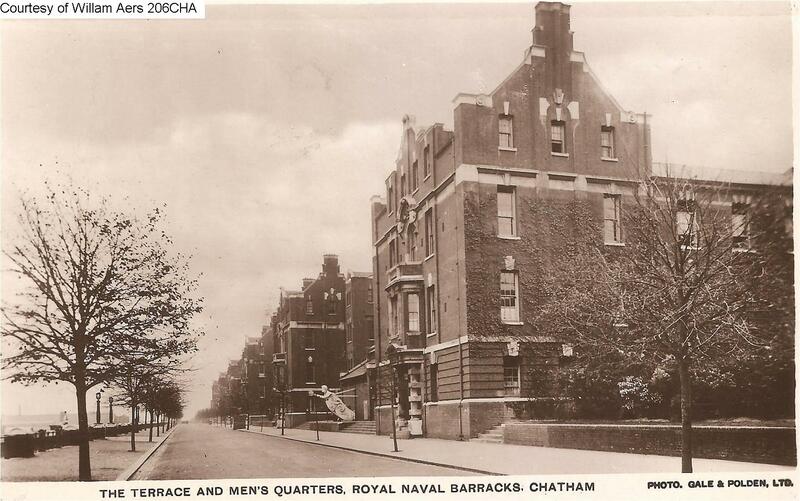 Chatham was one of The Royal Navy’s three manning ports and was a hub of naval activity with the reserves and a number of operational ships being based there. The Royal Naval Barracks played a large role in housing those who manned many of these ships. In this video, Victor Chidgey talks about Seaman Thomas George Perry, whose ship was torpedoed by a German submarine on August 15th 1918. He survived, and fled the Navy after he returned to England. ‘Now that’s my Grandfather Chatham Seaman just an ordinary Seaman who was involved in momentous events. He was forcibly put into the navy when he was 12 years old by a magistrate in London because he was caught being vagrant and the magistrate said you’re not a bad body but there is a danger of you becoming one so we’ll send you to Chatham to join the Navy. So he came down here in Chatham much against his will and he was annoyed about it so they said ‘Oh your one of those are you well we’ll put you in Pembroke and you can learn boxing’ and he said he was in the ring 30 seconds and some tiny little kid knocked him out so he thought he better learn his boxing properly. And then he was put on the Armageddon, a battle ship, went off to Malta and came back in 1914 his 7 years were finished. But he came back from the Spithead review and they said ‘no you’re not leaving the navy, from now on your HO (Hostilities Only), when the Wars over you can go’. ‘Right’ he said so that was mark one against the Navy, that was the first thing that upset him. He was on the Zeebrugge raid, he was destroyer man when the war progressed on the Zeebrugga raid. He based his time at Harwich in a brand new destroyer flotilla and he was on ‘H.M.S Ulieswater’. 1918 early February (*August) they were escorting a convoy of the Dutch coast when the ‘Ulieswater’ (it was about 3 months old) blew up and the captain said ‘ah mine ‘ he radioed ‘I’ve hit a mine’ the flotilla leader the ‘(H.M.S.) Scott’ came alongside and that blow up. It wasn’t mines at all it was torpedoes it was a U-Boat sitting there thought he’d had a bonus day 2 Royal Navy ships. So my granddad he went from the ‘Ulieswater’ across the deck on to the ‘Scott’ and when the ‘Scott’ started to sink he took to the boats and when they were torpedoed or sunk they got 2 weeks survivors leave. So he thought ah I’m due for a month. He got nothing. They said ‘no you never got your feet wet. You never actually landed in the Sea, so you can’t be a survivor’. Mark 2 against the Navy, didn’t get it. Even when he was a very old man he used to say to me ‘Oh I never got my leave you know’. So back to Harwich, he was busy the whole time and then the War ended. 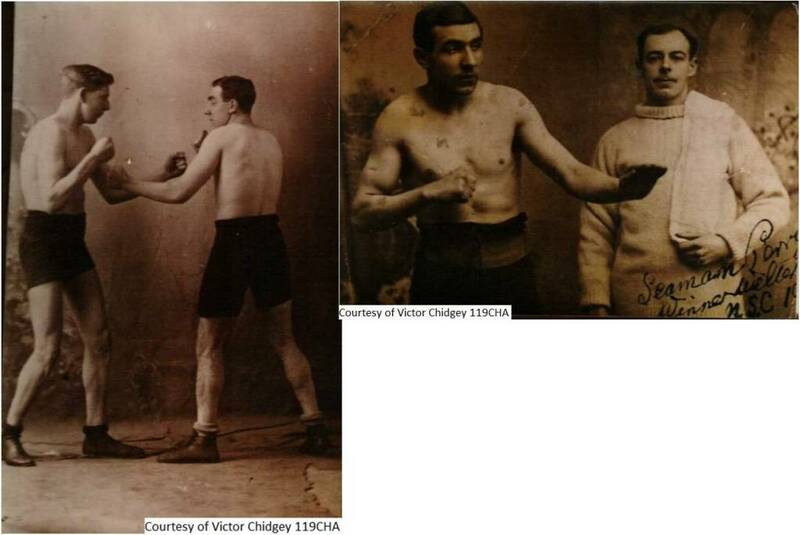 Come 1919, the Navy didn’t release him because, by this time he had become the Navy’s welter weight boxer and he was pretty good and they wanted him to stay boxing and boxing. They sent him to the national sporting club to fight/box with the army which he won he was very good kept it all and they said ‘no you can’t leave’ he said ‘but the war’s over’ and they said ‘yes we are aware of this but very sorry Seaman Perry we can’t let you go’. So what would you do? He walked off on his own. Took his mother’s maiden name and went selling fur coats. ‘I give em 3 chances’ he said so that was fair enough wasn’t it. So the Navy never caught up to him at all? Image, film and text courtesy of Victor Chidgey.